When addressing the issue of waste elimination in polite, paleontological company, the technical term for the fossilized material is a coprolite, but thats the solid stuff. Liquid waste, however, has no established vernacular. Perhaps this is because it is an area of study almost completely without evidence. How do you fossilize liquid waste? Katherine McCarville, a geology Ph.D. candidate at the South Dakota School of Mines and Technology concentrating in vertebrate paleontology, thinks she may have found the answer serendipitously after watching the movie Walking with Dinosaurs in which a Postosuchus is shown relieving itself in an act of marking its territory. Although some paleontologists were annoyed with this speculated caricature of the animal, McCarville thought the film raised an intriguing question, and one she might be able to solve. She had recently investigated a shallow, bathtub-sized depression among the trackways of the Purgatoire Valley in southern Colorado as part of a field trip to the Picketwire Canyonlands. 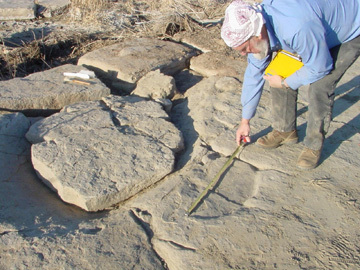 Gale Bishop measures what might be a footprint of a sauropod near the rim of the bathtub-sized depression, which is covered with blocks to prevent further erosion. Photo by K. McCarville. In a book about the Purgatoire trackways, Martin Lockley of the University of Colorado at Denver and his co-authors refer to the sedimentary-filled basin as an enigma, perhaps the spot where a dinosaur laid down along the Jurassic lake shore or where a carcass of an animal was washed in while sediment deposited around it. When she saw the film, she thought: Well, of course thats how you form a structure like that. With funding from the U.S. Forest Service for travel and in cooperation with Comanche National Grasslands personnel for access to the site, McCarville studied the depression in detail. She presented her findings as a poster at the October meeting of the Society of Vertebrate Paleontology in Norman, Okla. She hypothesizes that a fluid stream from a sauropod hit the sandy limestone layer from a height of about 2 meters and agitated oolites, particles of sediment shaped like ball-bearings that can form in shallow lake environments. The stream of fluid would have eroded into the clay layer, ripping up clasts. When the sediment settled back into place it left tell-tale signs of a fluid scour, she says: a graded bed with the larger, heavier clasts and grains at the bottom. Sauropods share a common ancestor with meat-eating dinosaurs and birds. To further their evidence, McCarville and her husband Gale Bishop  co-author of the poster and director of the Museum of Geology at the South Dakota School of Mines and Technology  have turned to the field of biology. They videotaped ostriches urinating a strong liquid flow and researched bird bladders to confirm that many birds indeed release a liquid waste stream. Horner expects that they will need to further this phylogenetic study to include alligators, because dinosaurs as a whole are part of the class called Archosauria, which also includes pterosaurs and crocodilians. He looks forward to a more rigorous and peer-reviewed paper from McCarville. Well all be excited to see what she presents, he says.